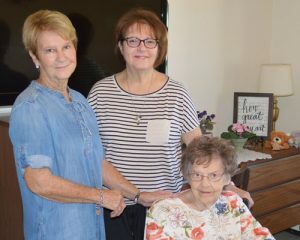 All posts tagged: "senior living"
Home Posts Tagged "senior living"
Helen “Jayne” Josephson, accompanied by daughters, Nancy (Scott) Perinar and Suzi (Scott) Ness, fondly reflects on her time living at Our Lady of Angels Retirement Home. Before even beginning her interview, simply by entering her room, one can feel the amount of love and care. Looking around Jayne’s room, one will notice a few African Violets on her desk. One of Jayne’s past hobbies included growing African Violets. She still keeps a few in her room to brighten her day. Nancy adds, “Communication is also really wonderful at OLA. They will call and update us often on how mom is doing.” OLA strives to make residents feel safe in their surroundings and their loved ones secure in knowing they are receiving the care they need. 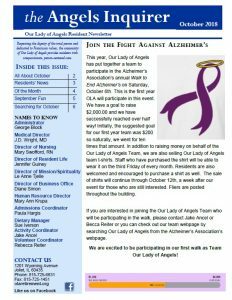 Surrounded by love, supported by her family and cared for with kindness, Jayne’s story with Our Lady of Angels continues. Enhance your quality of living and enjoy Our Lady of Angels, a resident-centered, retirement home community providing high-quality care and rehabilitation services for seniors. Call and schedule a tour today, 815-725-6631 ext. 4113. Our October newsletter is here. 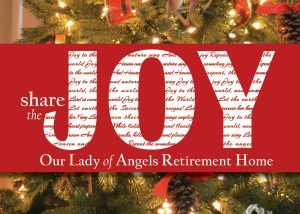 Click here to read this month’s Angels Inquirer. OLA’s October Activity Calendar is here! We have fun and ‘spook-tacular’ activities and outings planned for our seniors. Along with weekly favorites such as Music Therapy with Sr. Odelia, Crafty Corner and Music with Margaret keep a look out for our Stamp Convention on Saturday, October 13th, BINGO with the University of St. Francis Football team on Wednesday, October 24th and OLA’s Halloween Parade & Monster Mash Bash on the 31st! Click Here to view our October activities. Caring for a loved one full time is a major responsibility. Being available to take care of that person 24/7 is not always possible. 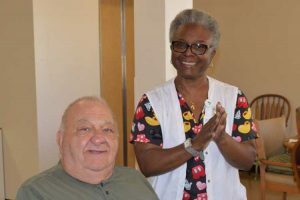 Whether going on vacation, having an unavoidably busy weekend or just needing a mental and physical break, Our Lady of Angels Retirement Home (OLA) provides respite care services for seniors. Have peace of mind in knowing your loved one’s wellbeing is in the best of hands while you are away. While away, the family can call OLA’s Nurses Station to get frequent updates. If the family is in the area and would like to stop in, it is nice to take a break from the caregiver role and return to son, daughter, spouse etc. and simply enjoy themselves while visiting. Enhance your quality of living and enjoy Our Lady of Angels Retirement Home, a resident-centered community providing high-quality care and rehabilitation services for seniors. A welcoming community awaits perspective seniors and their families. Call and schedule a tour today. To speak directly with OLA’s Admissions Coordinator regarding respite care services, call 815-725-6631 ext. 4113. 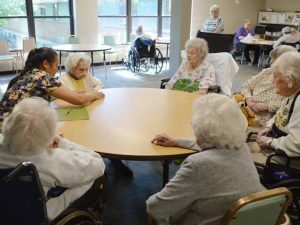 Our Lady of Angels Retirement Home is committed to serving the whole person – mind, body and spirit – with compassion, justice, hopefulness and joy. Founded by the Sisters of St. Francis of Mary Immaculate and rooted in spirituality, OLA visibly speaks to the faith and Franciscan values that are core to the mission, as well as reflects these Catholic traditions through person-centered care. Visitors and residents might first notice the statue of Our Lady as they drive by the front courtyard. Walking in OLA’s front doors, you are greeted by large mosaics of saints Francis of Assisi and Clare that welcome visitors into the Chapel located at the center or hub of the building. Residents and surrounding community members can attend mass in the OLA chapel every day of the week. With warmer weather here, OLA residents take advantage of beautiful walking paths for outdoor Stations of the Cross. Numerous statues of saints, angels and the Sacred Heart grace all flower gardens and walkways. Special religious programs are offered to residents seasonally and throughout the year. In May, residents gather in the Chapel daily to pray the Rosary. A special “May Crowing” celebration is also held. The first Friday of each month is Eucharistic Adoration and Anointing of the Sick. 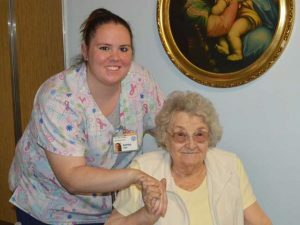 Special programs assist with residents’ spiritual needs in an individual or group based environment. 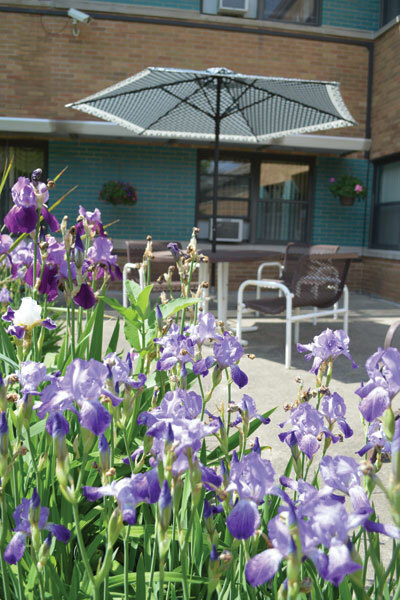 Our Lady of Angels Retirement Home offers residents a different focus and atmosphere for senior living centered around supporting and nurturing each person’s spirituality. All are welcome!